Everywhere you go and everything we do now a day seems to involve technology. I just saw a Facebook post where kids are playing in a museum display with a phone booth, and someone commented, “I bet those kids can’t even imagine using that type of phone”. We have adapted to this digital age and are enjoying having all of the convenience and information right at our fingertips. Unfortunately, one of the downsides to this technology is the side effects it can have with our vision. These symptoms may be caused by numerous factors (as per AOA) such as poor lighting, glare on a digital screen, improper viewing distances, poor seating posture, and uncorrected vision problems. Some of these factors and symptoms can be improved by adjusting your seating posture, improving your lighting, or taking breaks while using your digital devices (20-20-20 Rule: every 20 minutes of up close work, look 20 ft away, for 20 seconds). But in most cases, we need to do more than just take breaks or improve lighting. At Elite Eye Care, we have two amazing eyeglass lenses to help with the eye related symptoms that come from digital eye strain. The first lens is what I wear in every pair of eyeglasses that I have, which is the Zeiss Digital Lens. This lens has a clear distance just like every pair of eyeglasses but at the bottom of the lens it has a little increase in power to help your eyes relax while reading or using a digital device. The Zeiss Digital lens is great for kids through early-mid forties. It is a very functional lens that has been great for anyone finding themselves suffering from Digital Eye Strain. The second lens that I recommend for Computer Vision Syndrome at Elite Eye Care is the Zeiss Office Lens. This lens can be adjusted depending on your needs but it is essentially a progressive lens that has been made more for intermediate/near vision. 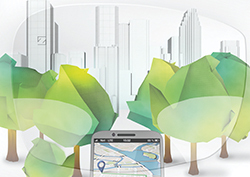 A conventional progressive lens provides a limited field of vision in the mid-distance viewing zone. 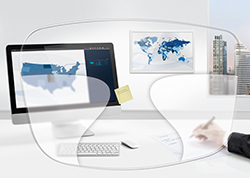 ZEISS officelens covers the wearer’s needs for reading, workplace, and room distance. 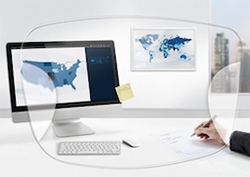 As pictured above- the conventional progressive lens is made to have the widest section for distance (on top), the next largest section for near (on bottom), and the narrowest section for intermediate (the middle)- this is also where you view the computer. The Zeiss Officelens removes most of the distance section from the lens to make the largest sections for the intermediate/near portions of the lens. This is a perfect lens for someone that spends most of their work day looking at a computer. Most people think, why would I want a pair of eyeglasses that does not have my distance prescription in it? I say to them, do you spend 8 hours a day driving or looking in the distance, or is your primary vision at the computer? So, in my opinion your primary pair of eyeglasses should be for the computer/digital devices and your secondary pair for driving or distance. I wish we could make a progressive that had each section clear and comfortable, but at this time it is not possible. So, I would recommend investing in your primary visual needs, which for most people is for digital devices. Why be uncomfortable at your job or while doing things you enjoy like crafting, gaming, or using your social media? Finally, there is one final recommendation that I prescribe in every eyeglass prescription (even in children), which is anti-reflective lens enhancements. This lens treatment reduces glare from poor room lighting, digital devices, and oncoming head lights when night driving. It also provides a scratch resistance to your eyeglass lenses. I hope that describing my two favorite Zeiss eyeglasses lens has been helpful and may be something that will improve your visual comfort. Our motto at Elite Eye Care is “See Life Better” and sometimes that involves stepping outside of your normal/everyday pair of eyeglasses and trying something new. If you have any questions please feel free to contact our office.